Description: This patch will disable the 2-player flag and instead loads a character based in what option you've selected at the title screen. NEW - Changed hijack to a different area, allowing more compatibility with other patches. Also, in SA-1 ROMs, it runs inside the chip, allowing increased speed. This is a very user-friendly patch. It is even better if it is combined with the patch below. However, I think that it is difficult to understand the name of this patch itself. 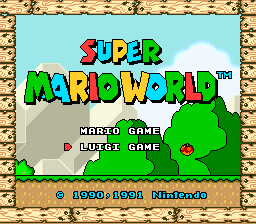 It is difficult to understand that "SMB TLL" stands for "Super Mario Bros. The Lost Level". How about changing to "Luigi mode" or "Luigi game" etc? This patch has a glitch where it loads wrong GFX/palette if Luigi starts from different submap. This patch has a glitch where it messes up the bonus game graphics (the one that can be found in various warp pipes, not the one that you get for 100 bonus stars). To avoid it, delete the code in the .asm file that references the .bin file, and use https://www.smwcentral.net/?p=section&a=details&id=4579 to change the 1-player/2-player text instead. Good patch, approved. This update is pretty useful because with the little change, compatibility and efficiency improved a lot more, warranting to this patch work much better together other patches. Small issue, if you have mario and luigi's graphics seperated, using this patch if you continue off of a existing save, luigi will appear as a green mario until you go into a level and leave.